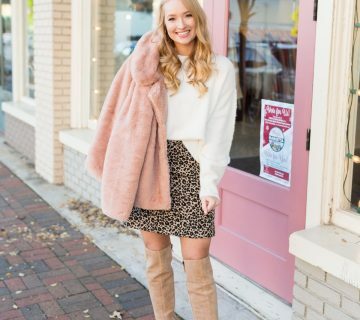 I purchased these sequin and velvet pants on Black Friday and couldn’t wait to style them for a holiday look! Because of that, I refused to wait until I could switch them in for a smaller size, which I definitely recommend. I’ll take anything sequin and velvet this winter, so combining the two was a win-win! Plus these feel like sweatpants but are probably the most glam piece I have in my closet! Those pants are SO fabulous and perfect for a holiday party!! Love them! They're a little out of my comfort zone but I'm glad I went for them! So comfy and definitely a statement!